Our current herd sire is CWF Fairfax (left). He is correct, strong, and follows the breed standards from North American Cashmere Goat Breed Standard. His offspring are strong and lively. Thank you for your interest in our herd of high quality Cashmere Fiber Goats! We first brought Cashmere goats to our farm in 2013. We found their calm and gentle personalities and their production of luxurious fiber suited our family farm well. Cashmere goats are a type, not an actual breed. However, they must produce fiber of a certain quality and conform to certain physical standards. The demand for cashmere, the fine underdown from cashmere goats, has always exceeded supply. Cashmere is the softest most prized fiber for sweaters and suiting. Cashmere is soft, light weight, durable, very warm and makes wonderful feeling garments for wearing. It has long been one of the most exotic and rarest fibers to be found. The fleece of Cashmere goats is made up of two distinct fibers. The coarse outer hair and the fine cashmere undercoat, called guard hair. The fine undercoat (under 18.5 microns in diameter) is the source of Cashmere fiber for clothing. Our average diameter is 14.5 microns, SD of 3.4. CWF Fairfax: Fairfax represents just about everything one could want in a Cashmere buck. He has tremendous eye appeal and is strong and hardy. His fine white cashmere fiber is exceptional. His long, white guard hair provides softer and finer fiber than the short-haired cashmere goats, giving a feeling softness and has a tighter crimp. At the 2014 CGA International Fleece Competition, Fairfax was awarded Honorable Mention for his first fleece. His twin brother’s fleece was champion of the combined first and second fleece wether category. Fiber average diameter = 14.5 microns, SD = 3.4. Fairfax has tested CAE Negative. Fairfax is now available to your farm, by artificial insemination, distributed by www.biogenicsltd.com. 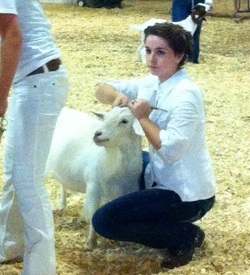 Denwally Farms Blackstrap: Blackstrap is a two time Champion Cashmere Buck at Oregon Flock and Fiber Festival. His daughters have won Champion Junior Doe twice in 2014 and 2015. His kids have also won Grand Champion Doe and Diamond Fiber Goat doe in 2014. His kids have been abundant, fine fleeces some kids producing up to 5 ounces. Backstrap’s fleece has tested MGF-12u and Spin Fineness 14.8u with a Comfort Factor of 100%. Blackstrap is CAE negative, very large averaging 200 pounds, stands square on excellent hooves and legs. ​*More buck information to come! We have several other bucks that we use and that are for sale that have not been uploaded.